If you’re new to cycling or someone who hasn’t cycled for a while, congrats and welcome to the wonderful world of two wheels (and sometimes three). YAY. 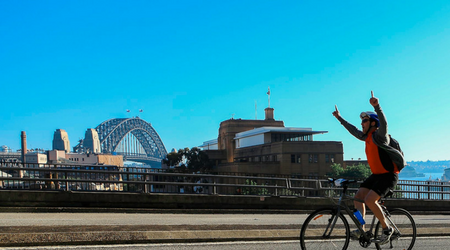 Now we know that riding on Sydney cycleways or road paths can be overwhelming, so to ensure that you are equipped for any ride we wanted to share some basic do’s and don’ts for cycling. 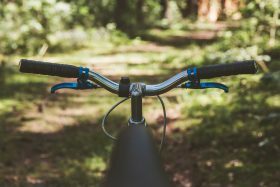 Riding bikes should be fun and in order for you to get the most out of your ride you'll want to avoid the most common cycling mistakes for beginners. We know finding the right seat height can be tricky and some of you might spend hours trying to find the most comfortable position. An old myth to get the right position is to sit on your bike and if your feet are sitting flat on the ground you’re in the correct position - BUM BOW! - this is a no, no. 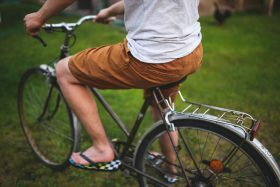 The rule of thumb is to ensure that your bike seat is sitting level with the top of your hip bone which will give you a very slight bend in the knee when your foot is at the bottom of the pedal stroke. It is essential that you get your seat in the right position to prevent any knee or back injuries during your ride. If you’re still unsure, or your seat is still not feeling right we strongly recommend you to head down to your local bike shop and they will be more than willing to fit your bike for you. You’ve just bought a shiny new bike and your ready to take your new baby for a spin and something just ain’t right. You’ve adjusted your seat as per the above tips, pedals are in place then you go to reach for your handlebars and they’re way too low or high. It’s important to have the height of your handlebars correctly positioned to avoid stress on your back, wrists, neck and arms. Don’t fret, it’s a simple fix! 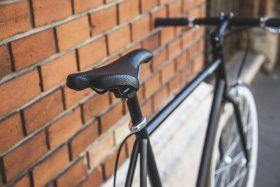 Most handlebars can be raised or lowered by loosening the screw on the top of the handle bar. Hot tip - set your handlebar so that it is the same height as your seat so you can ride upright. As a first time rider or someone who hasn’t cycled for a while, it is vital to not put too much pressure or stress on yourself when it comes to your riding gear. 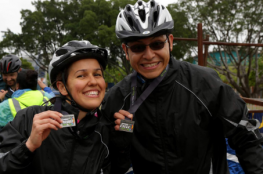 Experienced cyclists or ‘MAMILS’ are decked out in all the top riding gear which can enhance their riding experience, however if you’re a first time rider, it’s best to keep it simple. Riding gear can cost an arm and a leg, so if you’re wanting to just go out there and enjoy the freedom of riding all you need are three essentials: a bike, a helmet for safety and shoes for comfort. Whether you’re planning to ride for an hour, two hours or four it is essential you bring water and snacks with you to keep you going. If you have a riding top with pouches or a backpack, it’s a good idea to stock up on some energy gels or chews from the GU Energy range to help optimise your performance. Most importantly carbs are your best friend on any ride, packing a banana or a muesli bar can always give you the extra boost you need to continue riding. But no matter how much you carb load, do not forget to take a break. This goes for all riders, safety always comes first, so be sure to look after yourself on a ride! Don’t let the clouds fool you. Even on the cloudiest day the ultraviolet rays are out and looking for some fresh skin to burn. Don’t let it be yours! Apply sunscreen with at least 30 SPF to your skin 20 minutes before your ride. 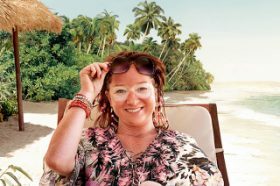 When riding the wind can also burn you so it’s essential to get your face (even if you are rocking some sunnies), back of your neck and those exposed knees covered in cream. Trust us, you don’t want to go back to work after your weekend ride looking like Rhonda. We’ve got your back, or should we say knees! 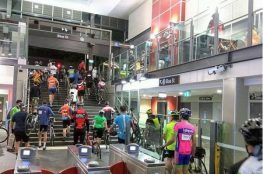 Now that you know the basic cycling mistakes new cyclists make and how to avoid them, it’s time to register for #SpringCycleSydney if you haven't already. Or better yet, encourage your friends, family or work colleagues to ride with you. Register now to save $10 off the final price of entry.